Without a doubt the Savute Channel is producing some of the most amazing game-viewing in years. In fact there is a beauty about its current state that is hard to describe… and we know from history that it is extremely rare to see it like this. Some of the sightings we have witnessed are beyond belief and the sheer numbers of so many species makes this one of the best spots in Botswana at the moment and we are still far away from the peak of the dry season! In the last couple of weeks the sightings have shown why this area is regarded as one of the best in Africa. The predators have been fantastic – but for the predators to be so prolific they need food and at the moment there are all kinds of wildlife drinking daily. 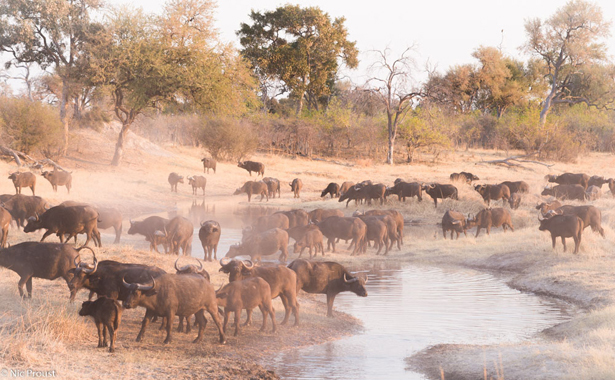 We are seeing buffalo and zebra like we have not seen in ages and estimates are up to 3,000 buffalo are using this channel with one herd of more than a thousand being seen every day at the moment. Zebras are seen by the hundred and move up and down along the channel feeding on a fresh flush of grass created from the moisture. There are all sorts of antelope and we are thrilled to be seeing the somewhat rare roan antelope in good numbers as well as the odd sable. Reedbuck have made their way back into the area and this is probably some of the population that thrived on the marsh when it had water until the beginning of 2015. 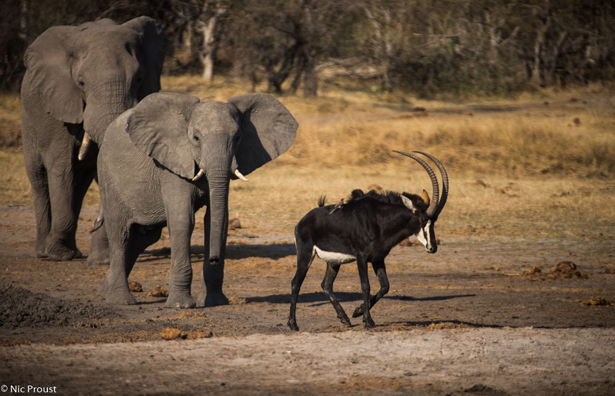 Red lechwe and waterbuck are ever present while impala herds are scattered all along while amazingly, we even recorded a herd of 68 wildebeest, the previous total records for a whole year only numbering in the twenties. The area is an elephant hot spot. Picture a channel full up with wildlife and add hundreds if not thousands of elephants and then suddenly it becomes seriously crowded and much larger elephants can be seen chasing all sorts of wildlife around that dare to drink in their vicinity. The leopard viewing around the source of the channel is something to behold and out of nowhere new female leopards are pitching up. We are not yet sure why but in just an area of about 1,000 ha (about 2,000 acres) we have recorded 10 different leopard – five adult female leopards, three of them which currently have cubs! With a couple of male leopards passing through the area – this puts the leopard concentration at one of the highest anywhere in Africa. To see so many leopard in one small area is incredible!